1) I used my right forearm a bit too excitedly at the gym.. ?from jumping jacks? I vote for the latter possibility since it is one-sided. But I didn’t think my kneading was THAT vigorous! I mean, I was a bit more vigorous in my kneading this year. Last year, it took me 20 minutes. Apparently, I needed more oomph. This year, my grandmother told me that the best strudel kneaders literally throw their dough onto the counter. And I happily followed suit. I don’t think I had to knead more than 5 minutes. It was perfect. The dough also pulled like butter. I must be improving. Keeping the strudel tradition alive within my family. It seems to have become an annual tradition, this strudel-making, or strudeling as we’ve dubbed it this year. Last year, we got in trouble for pulling the strudel dough Christmas morning, as my mom was trying to prepare for lunch and dinner. So, we did the next best thing: knead the dough on Christmas morning, but pull it and bake it on Boxing Day. 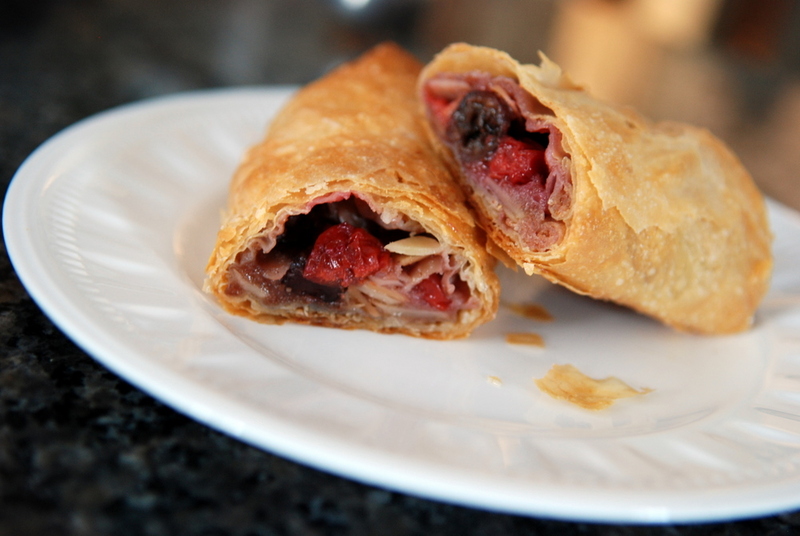 But the commotion certainly follows wherever strudel-making takes place. It is always center stage. 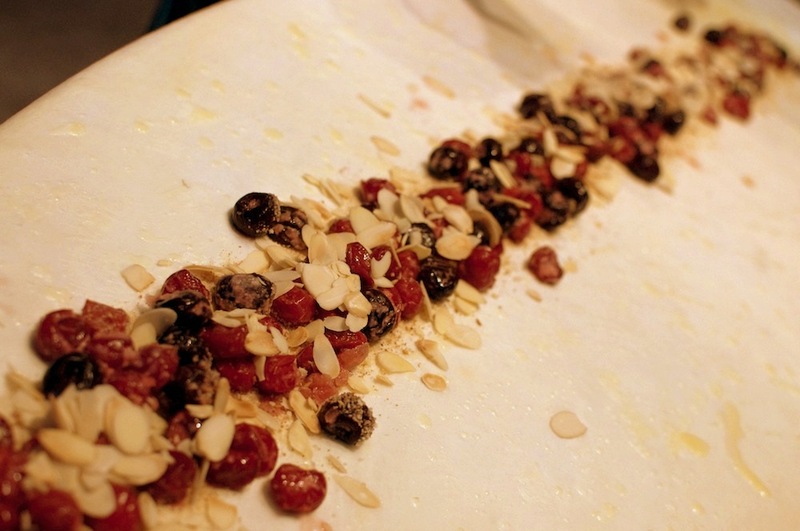 We made a traditional apple strudel and for the second strudel, we pulled together this delicious cherry and almond strudel. 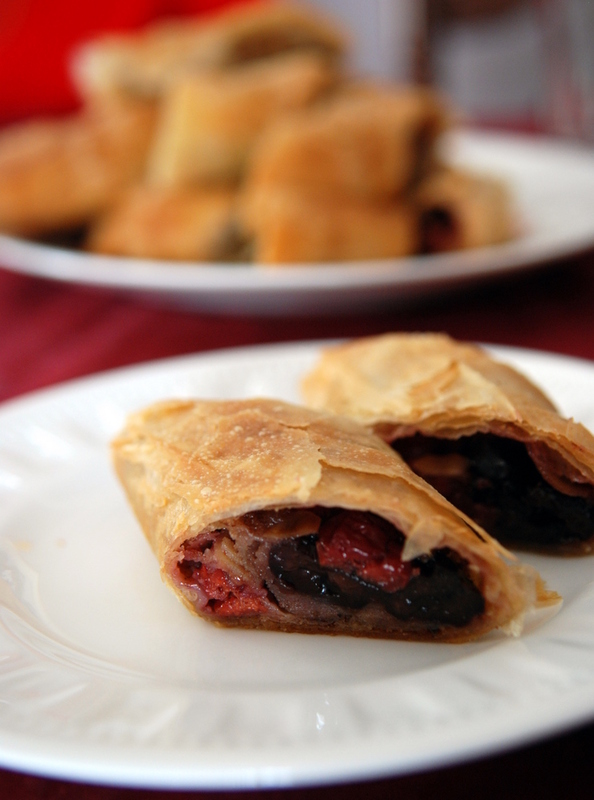 A mix of both sweet and sour cherries, accentuated with both toasted almonds and almond extract, with a hint of cinnamon, this was strudel experiment success. It is kind of hard to make anything unappealing when it is wrapped with freshly baked homemade strudel dough, but even my grandfather (the strudel supervisor) gave it the strudel stamp of approval. 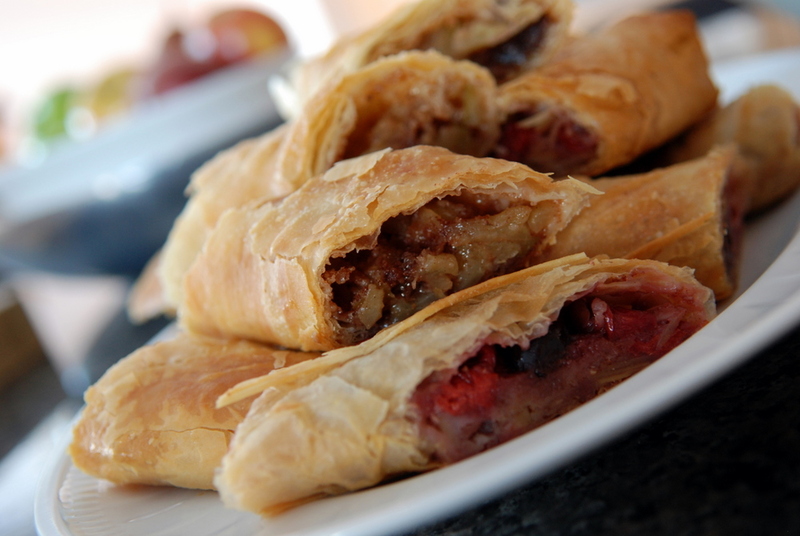 For step-by-step instructions on preparing the strudel and the recipe for apple strudel, see my previous post here. This is my submission to this month’s My Kitchen, My World, featuring dishes from Germany and mad props to Rob for the fabulous photo of the strudel filling. Tomorrow I am heading home for the holidays. It will be spent with great family, food and friends. And as I wonder what dishes I could make when I am home, I remind myself that no one likes mushrooms! WHAT?! Can it be true? I wasn’t really introduced to the foods my parents don’t like. Boiled beef (my Mom loves it, though – I have no interest in ever trying it!). Fair enough, my kids will never have to suffer through eating celery. Myself, I was a late bloomer towards mushrooms. I started with an affinity for shiitakes, and then fell in love when I tried enoki mushrooms. Shimeji are a nice woodsy, hearty mushroom, as well. Portobellos were always a nice meaty, treat. 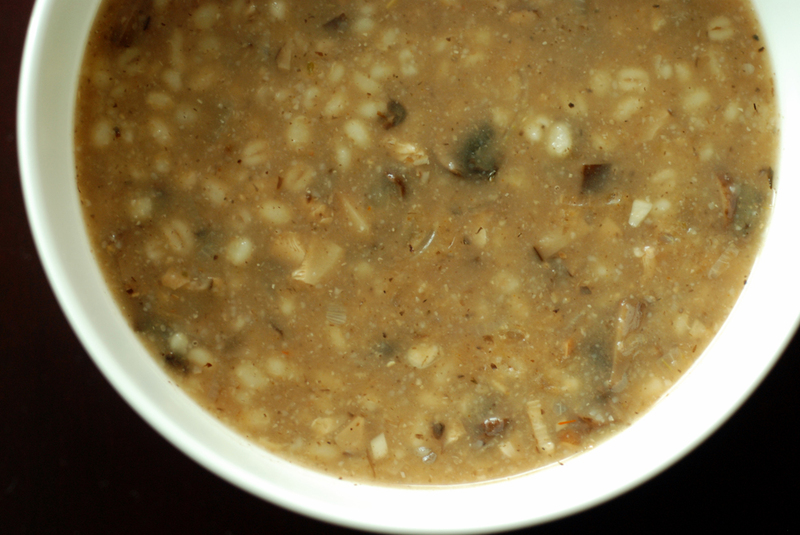 Then there’s the oyster mushroom, which tasted like seafood in the barley risotto. (Fair enough, I discovered my love for these wild mushrooms at the same time I found T&T!). I still shun the typical button mushrooms, especially if raw, but recently wanted to try yet another mushroom: cremini. Truth be told, cremini mushrooms are the same as portobello mushrooms. They are baby portobellos. Once they reach 4-6″, they have graduated to portobello heaven. They are similar to button mushrooms in shape, but taste-wise they are meatier – they are more dense with a deeper flavour. 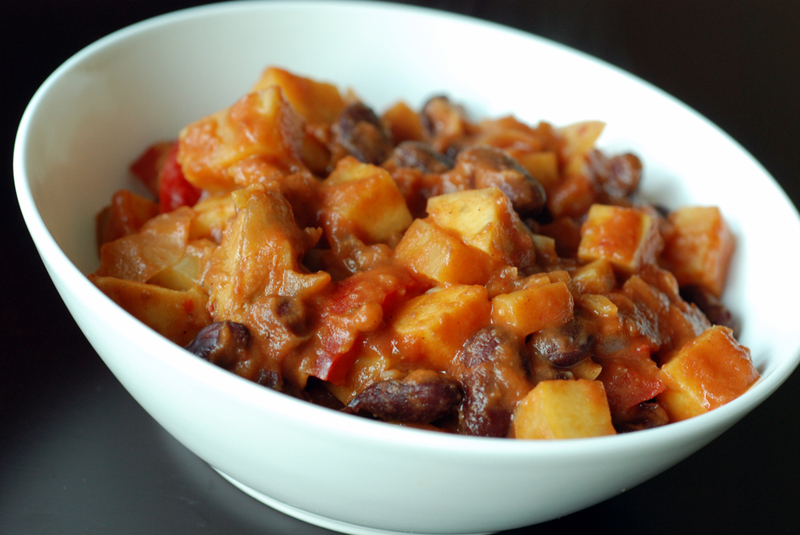 I was intrigued by Michael’s recipe for a Spanish Lentil and Mushroom Stew on Herbivoracious. He chose to use thick, quartered cremini mushrooms, that were browned. Because the mushrooms were thick, they kept their chewiness but were still slightly crispy on the outside. 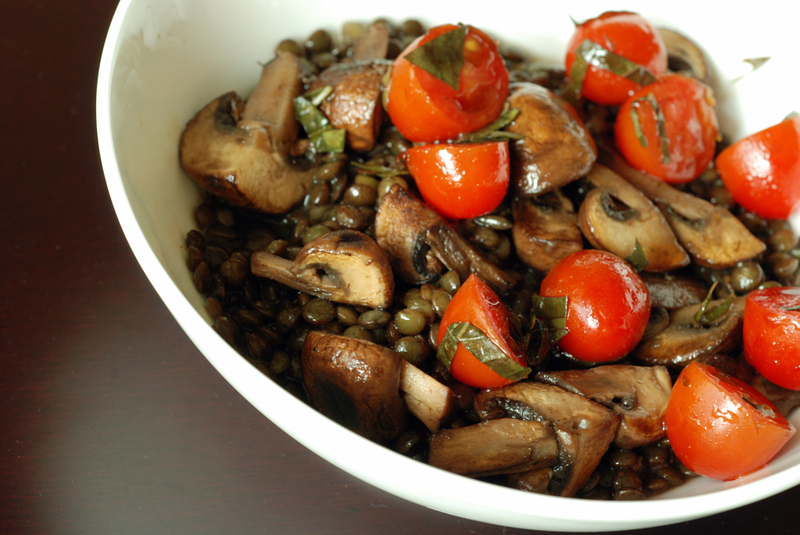 These flavourful mushrooms were paired with lentils with a hint of smoked paprika and a sherry vinaigrette, and topped with a light, sour tomato-basil salad. I enjoyed the combination of flavours, of textures and of temperatures. 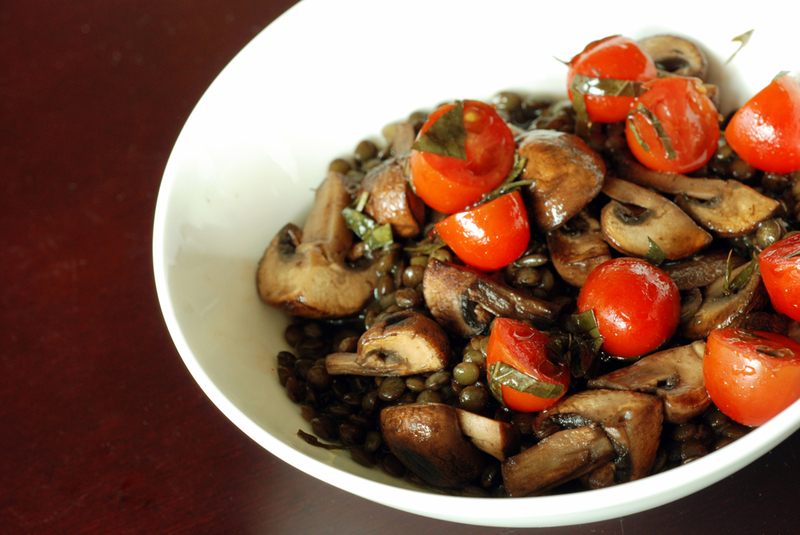 The lentils were smokey with the paprika but the vinaigrette and tomatoes were sour; the lentils were smooth, the mushrooms chewy and the tomatoes crisp; the lentils and mushrooms were warm, the tomatoes cold. You look at the ingredient list and notice how deceiving it looks. It worked really well. And now onto the winner of my first giveaway from csn stores. Congratulations to Janice who likes to make a noodle and vegetable soup. It sounds delicious. Let me know if you don’t get my email, Janice. This is my submission to this round of Blog Bites 9, holiday buffet, potluck-style! 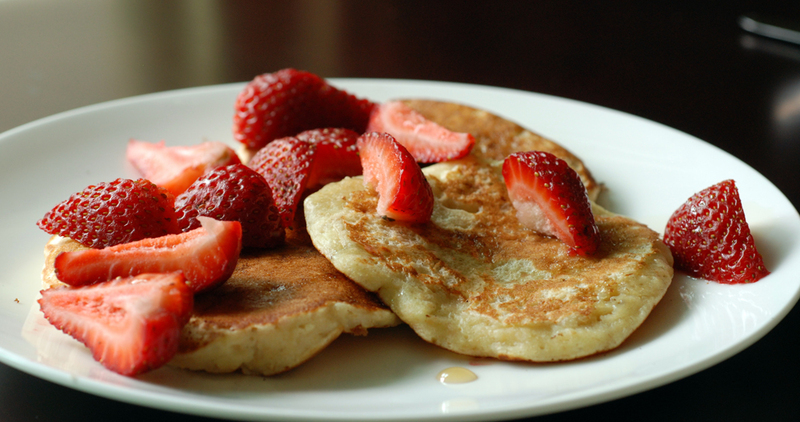 Pancakes are what I consider a splurge or luxury breakfast. Most of my breakfasts are quick to reheat in the morning, or don’t require that much attention on the stovetop allowing me to multitask in the kitchen. 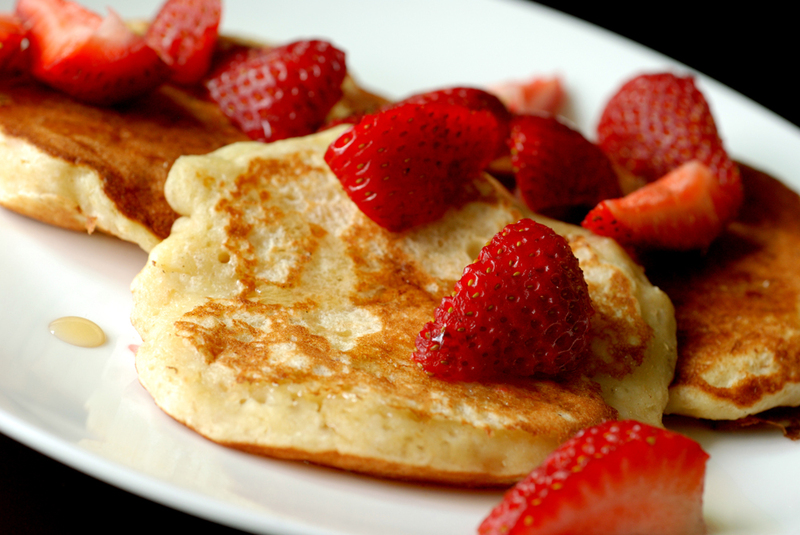 Pancakes are easy to make, but who wants to slave over the frypan so early in the morning? Add another insult to the injury because most recipes make a ton of pancakes, and pancakes tend to be infinitely better when fresh. 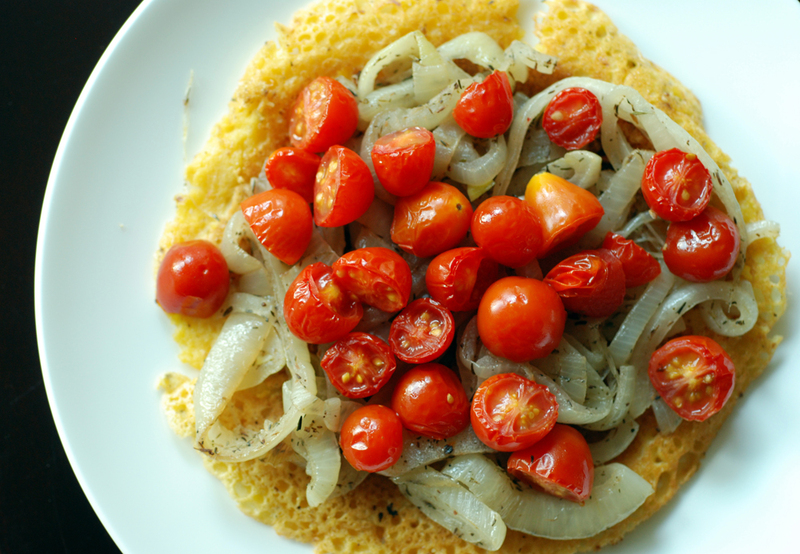 But for those special occasions, break out this pancake recipe. Or when you feel like eating an all-day pancake special, because that is what I ended up doing. 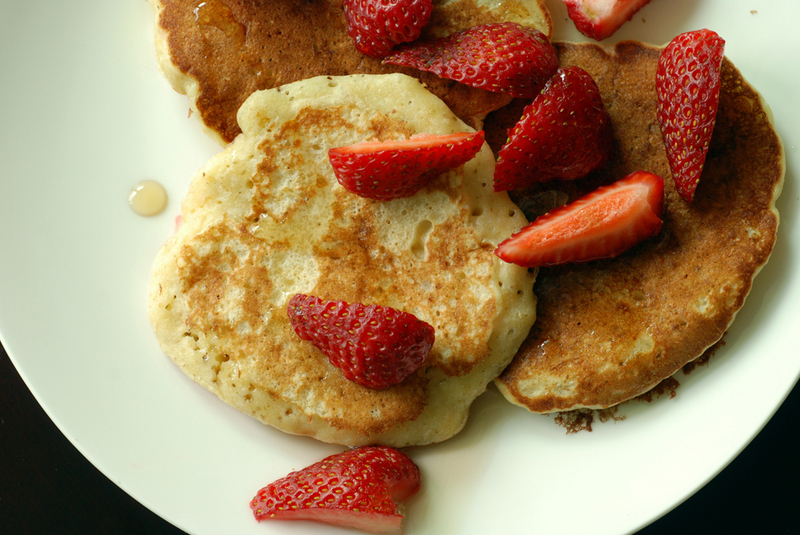 Adapted from Smitten Kitchen, who in turn adapted them from Good to the Grain, these pancakes are worthy of its high praise (308+ comments later!). Not your typical white, tasteless pancake, these are filled with oat flour (rolled oats that I ran through my food processor until fine) and oatmeal. White flour still makes an appearance though which is probably why they taste so great. They are moist, substantial pancakes and actually a bit sweet. The recipe calls for both sugar and honey and I would decrease the sugar next time, but otherwise these are perfect. 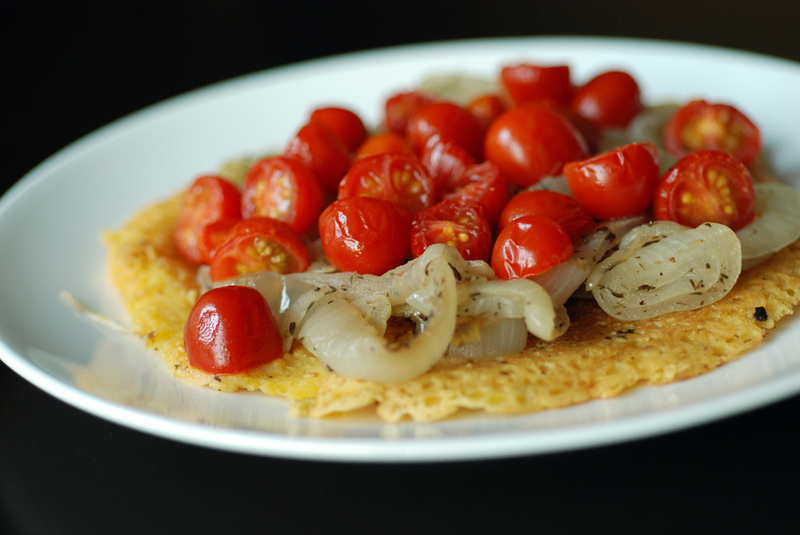 A great way to increase your repertoire of whole grain-based recipes and will please even the pickiest eater. Let me let you in on a secret. I actually haven’t done any holiday baking yet. I made the Key Lime Meltaways last year for Christmas. It took me nearly a year to post all my cookies from my holiday baking escapades, and one vegan cookie that wasn’t worthy of being posted (no one liked it!). While I am still plotting my attack of Middle Eastern-inspired cookies for this year (feel free to recommend your favourites! ), my current decadence has been over breakfast. But this decadence is guilt-free. Adapted from Oh She Glows, this is a version of overnight oats that I have been eating for breakfast some time now. 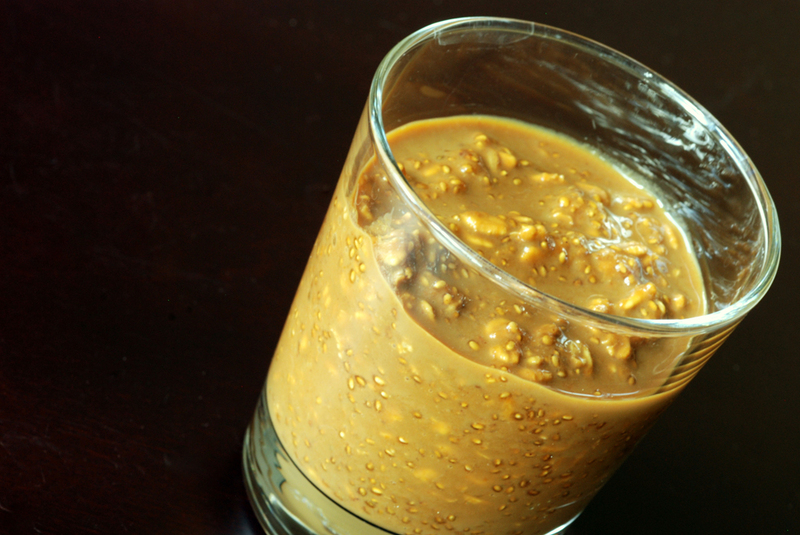 The premise of overnight oats is that you mix rolled oats with milk overnight to create a creamy pudding of sorts. I also add in chia seeds, which are tasteless but feel like small tapioca pearls after they have absorbed the milk. Chia seeds are great because they are relatively low calorie while providing a good source of omega-3s, fiber, protein and other vitamins. After a few hours, the chia seeds plump up nicely and add body to these overnight oats. In this version, the pudding is fortified with pumpkin puree, savoury spices (cinnamon, nutmeg and ginger) and the gingerbread taste comes from blackstrap molasses. Not to be confused with typical molasses (which is what typically goes into gingerbread cookies), blackstrap molasses are more bitter, as it is derived after the third extraction of sucrose. Therefore it is less sugary and more nutritious. It is a good source of calcium, iron, magnesium and potassium. Rolled oats, chia seeds, pumpkin, blackstrap molasses… all excellent foods and great together for a healthy breakfast treat. Going to the grocery store can be inspirational, or in my case, bad news. You see, I might walk in thinking I just want to buy spinach, or chickpeas, or what not, and casually glance at the eggplant on sale and walk home with that as well. It is not unusual for me to come home with 20 limes when they go on sale for $1. I have done this a few times. Without a plan, and they may not necessarily last long enough for me to use them either. My newest trick is to clean my copper-bottomed frypan with half a lime (or lemon) dusted with a bit of salt (my mom teaches me the most awesome things!). In this case, though, I walked home with a small bag of key limes. They weren’t on sale, but they were just so cute! And definitely not worthy of withering on my counter. Key limes are totally versatile, right? Hmm, no. But I already knew what I planned to make with them: Key Lime Meltaways. 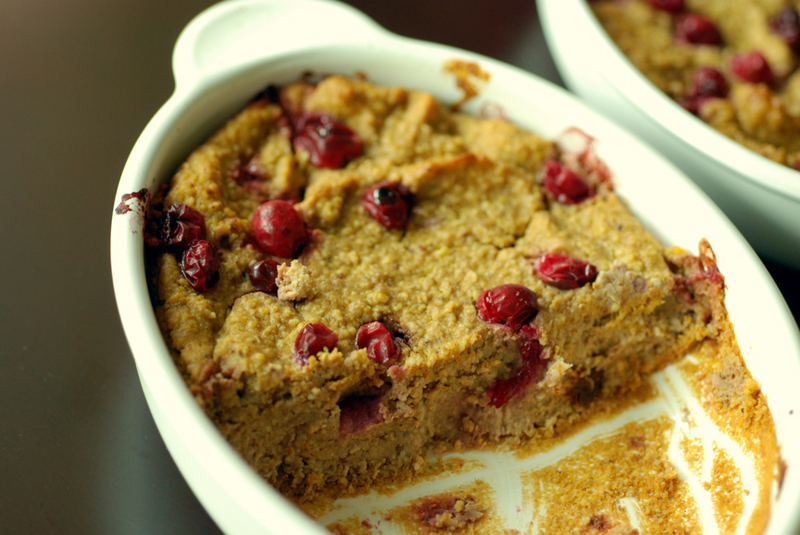 This recipe is from Smitten Kitchen, who adapted her recipe from Martha Stewart. Unlike Deb, I had to coax every last drop of lime juice from these suckers. We had to pull out all the tricks – microwaving the limes for a 10 seconds, rolling them on the counter and in the end, we also added a bit of pulp to the cookies as well. 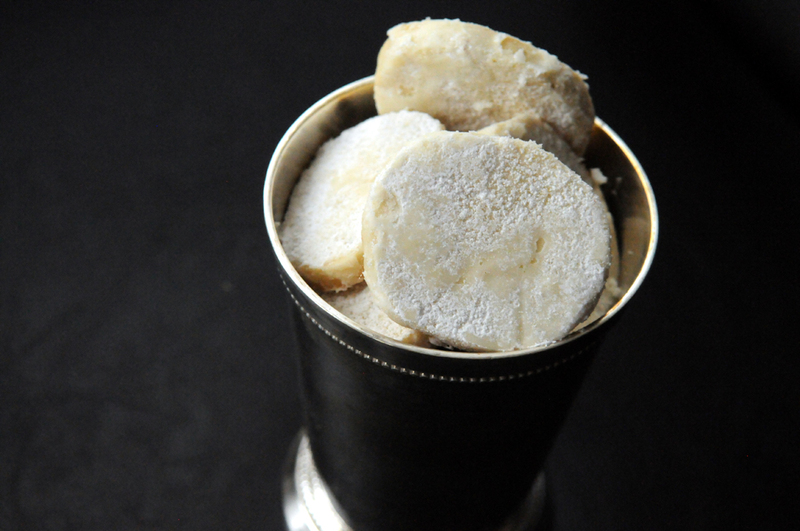 Akin to shortbread, these cookies melt in your mouth. 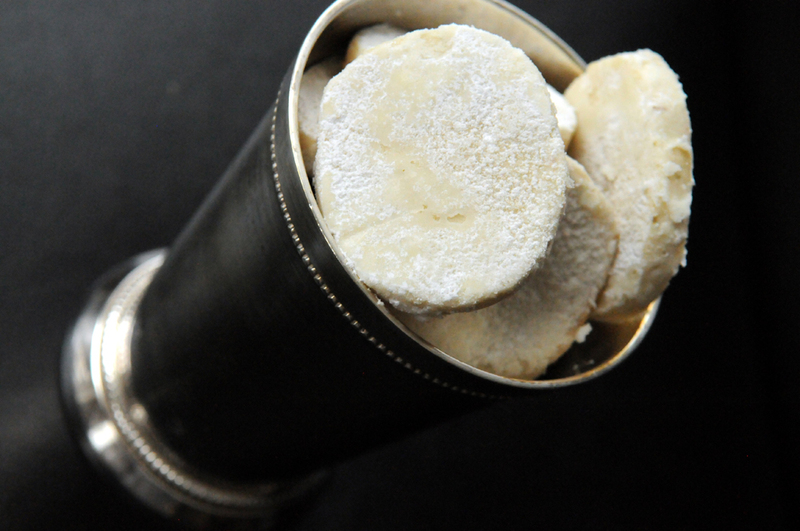 They have a hint of tart lime, kept in check with the dusting of icing sugar. 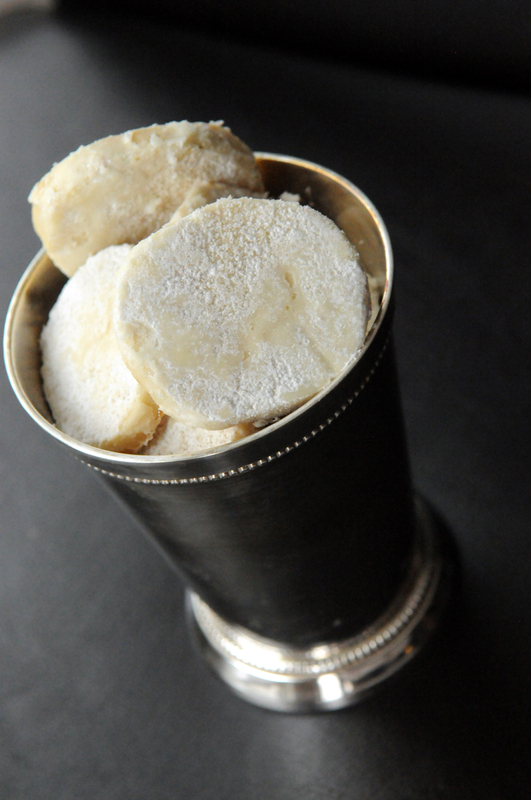 Creamy, smooth, tart and sweet all in a cookie. A nice cookie for your holiday table. I have nearly a week until I head home for the holidays and plan to eat out of my pantry/fridge/freezer. Wish me luck on not getting too distracted in the grocery store as I pick up more ingredients for holiday baking. This is my submission to this week’s Weekend Herb Blogging hosted by Haalo from Cook (almost) Anything. So I hmm’ed and hawed about whether to do this. At first, it sounded like a way to bolster google ratings (not mine, obviously). But in the end, I decided I shouldn’t deprive my loyal readers of winning a possible $65 to spend at CSNStores.com. Online, you can find anything you need for your kitchen, as well as other items like luggage sets as well. The prize doesn’t cover shipping costs, but you are free to spend it on any of their affiliated sites. This prize is only open to people with shipping addresses in Canada and the US. All you have to do to enter is leave a comment here, describing your favourite meal to make at home. Make sure you leave your email address so I have a way to contact you – it won’t be published. You have until Wednesday, December 22, 2010, at midnight to enter. 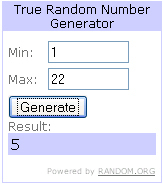 After that, I will randomly select a lucky winner. There’s something great about eating seasonal. And then there’s something about food blogging seasonally. I have more than a few posts in my drafts folder, as I figure out what to write, take the photos off my camera, go on vacation to Morocco.. You know, the typical delays. 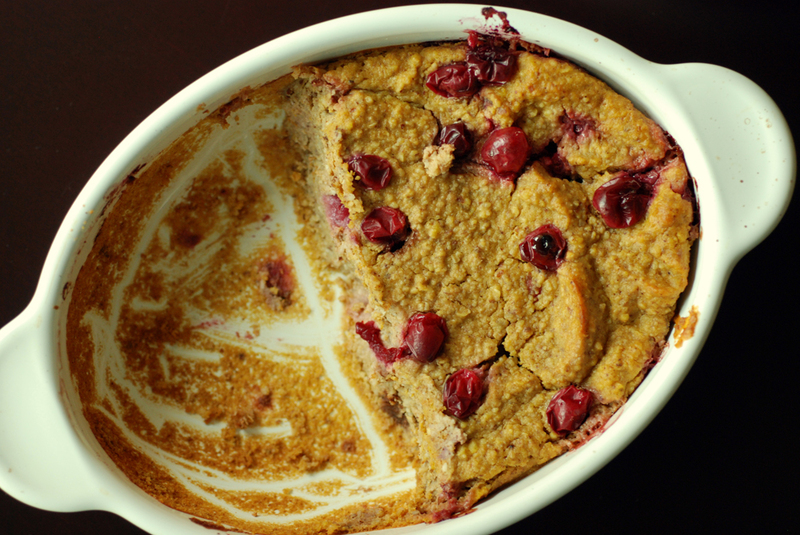 Adapted from Cara’s Cravings, this is a variation on the Baked Blueberry Oatmeal Breakfast Pudding I posted in September (based on Ricki’s original recipe). Back then, it was my pre-cycling breakfast of choice. This time, though, my pudding was a bit thicker, a bit lumpier, so I wonder whether I had to pulse my almonds longer. However, I enjoyed this variation, too, as it had a different mix of flavours. 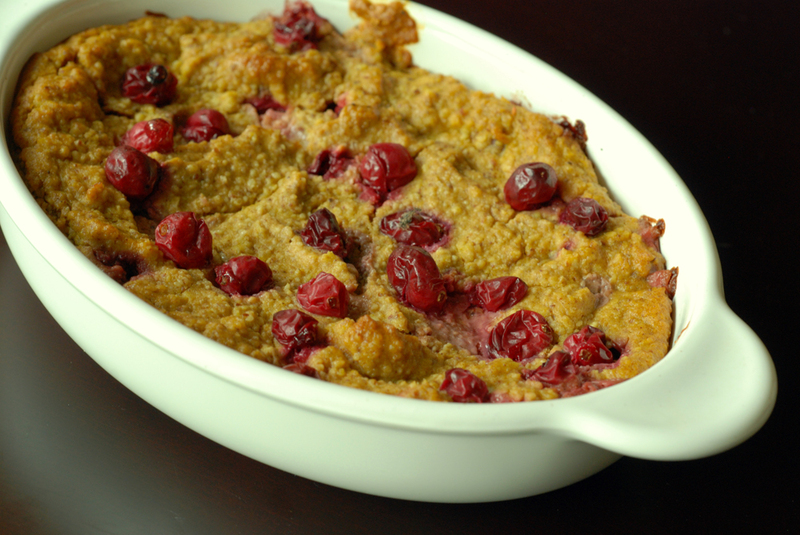 The pumpkin puree replaced the applesauce, the fresh cranberries substituted for the blueberries and the mix of savoury spices (cinnamon, ginger, cloves) worked perfectly. Not too sweet, and definitely not bland, this was a perfect start to the day. Likewise, it could work as a nice dessert as well. The snow has fallen, the salt is out and my bike has been stowed away for the winter. My winter jacket, mitts and hat are now in the front of my closet. I cleaned the dust off my winter boots. And what else does snow make me do? 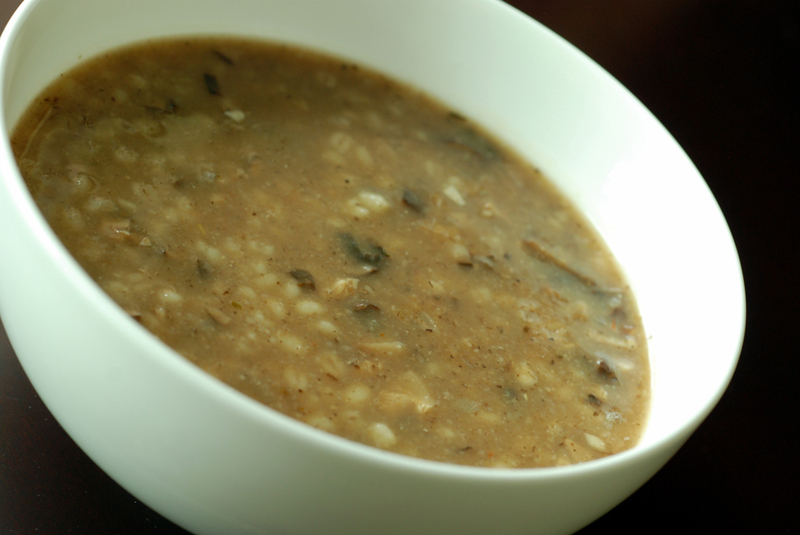 Adapted from the Williams-Sonoma Eat Well Cookbook, this is a hearty and creamy wild mushroom soup (sans creme) with barley and thyme. Something great to warm up with this winter. It is for serious mushroom lovers, with both dried shiitake and fresh cremini mushrooms. Tomato paste adds a deeper body to the soup, and the sherry adds a special flavour. Thyme, a perfect pair to the mushrooms, is a nice accent, along with the lemon juice. Nowhere have I mentioned cream, but this is a substantial soup with the pearl barley. The trick is to puree a portion of the soup for the creaminess. Aromas of Aleppo is a gorgeous cookbook featuring recipes from the Jews that formerly lived in Syria. But gorgeous photos does make a great recipe. 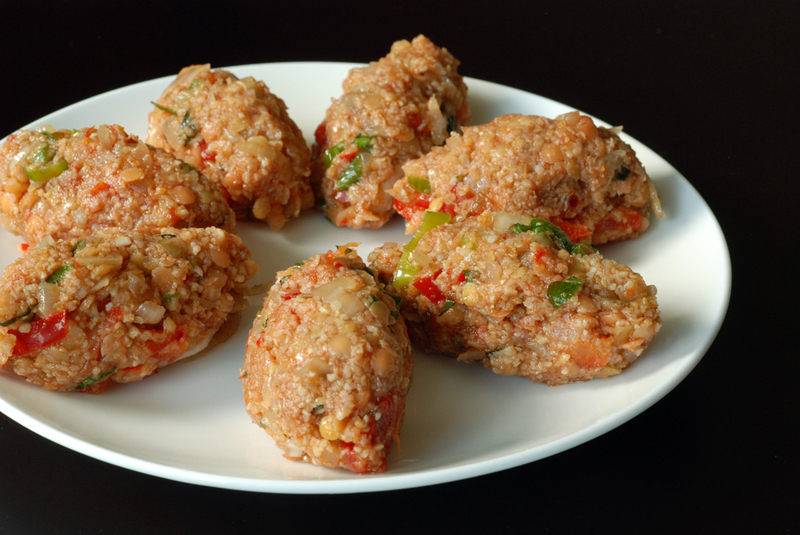 One of the recipes I was immediately drawn to was the vegetarian kibbeh recipe, which are bulgur patties with red lentils, minced tomato, bell peppers, scallions and seasoned with cumin and chili flakes. This recipe had everything going for it except one thing – the amount of oil. 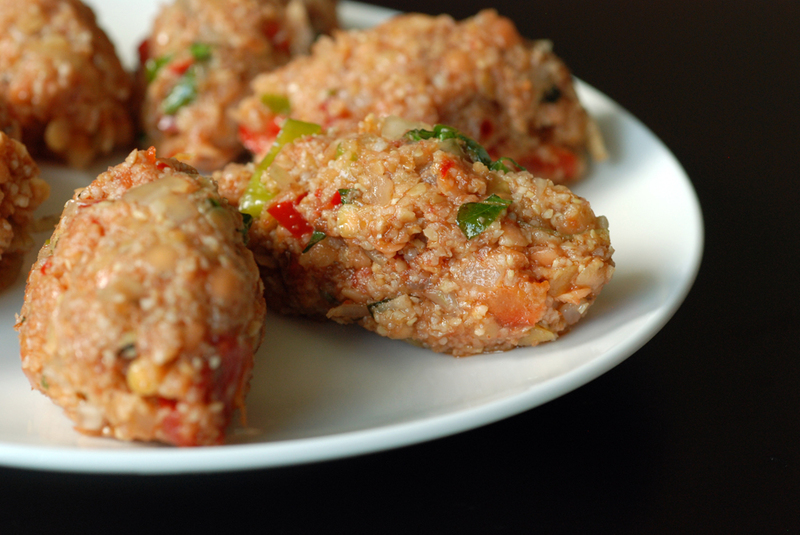 Kibbeh is common in the Middle East, and can be baked, grilled, fried or as in the this case, none of the above. After the bulgur and red lentils are cooked, they are chilled and then eaten as-is. I have adapted the original recipe. First I halved it because the recipe made a TON of food. Second, decreased the oil. The original (doubled) recipe called for 2 cups of oil, which is outrageous. I almost put it all in, as I wasn’t really thinking straightly at the time. Must. Not. Follow. Recipes. Blindly. My version still had too much oil, so I plead with you not the make the same mistake I did. You can definitely work with less, but feel free to experiment with the amount of oil to get a texture you prefer. These are very flavourful patties, but I will admit to only forming the torpedos for the photos. Otherwise, I just used a spoon to scoop out the mixture. Serve with tamarind concentrate, tahini, or alongside other appetizers. This is my submission to Tobias’ 14th Mediterranean Cooking Event, featuring dishes from Syria. Despite recently travelling to Morocco (more about that later! ), I am no expert in African cuisine. I didn’t come across any peanut stew in Morocco. A bit of research tells me peanut (or groundnut) stews are typical of sub-Saharan cuisine. I recently made an African pineapple, kale and peanut stew, and was intrigued to try peanut butter in a savoury dish again. 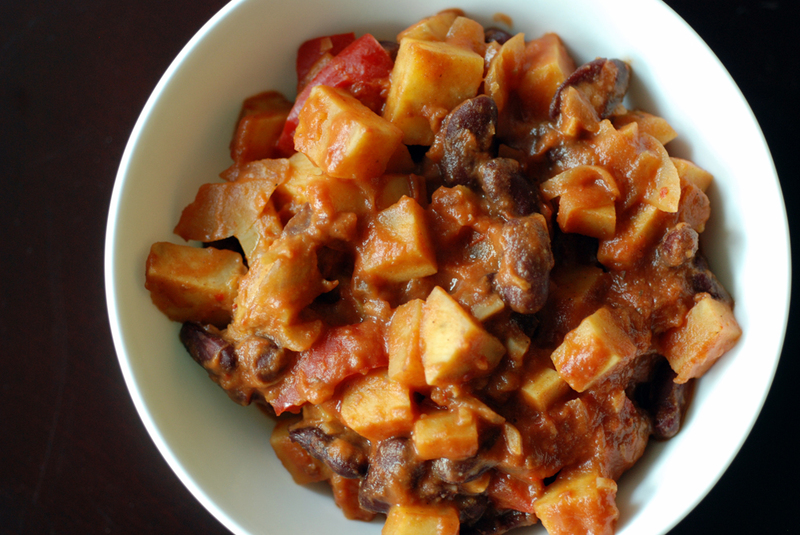 Adapted from Vegan Planet, this is a delicious vegetable stew. 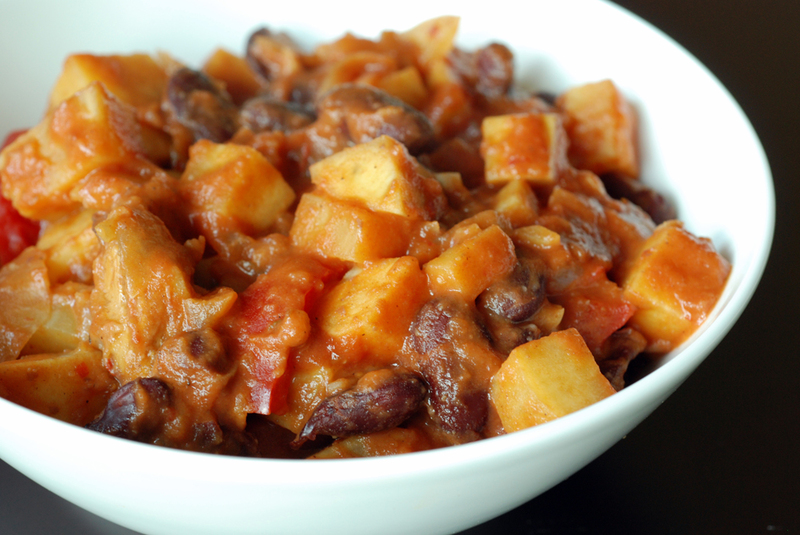 Again, we have a nice mixture of sweet from the sweet potatoes and tomato, with the salty and smooth from the peanut butter, with a touch of heat from chili flakes, ginger and garlic. Cumin and cinnamon make this a savoury dish indeed. Red kidney beans add substance and I enjoyed their mouth feel (I had forgotten how much I like kidney beans – it has been too long!). 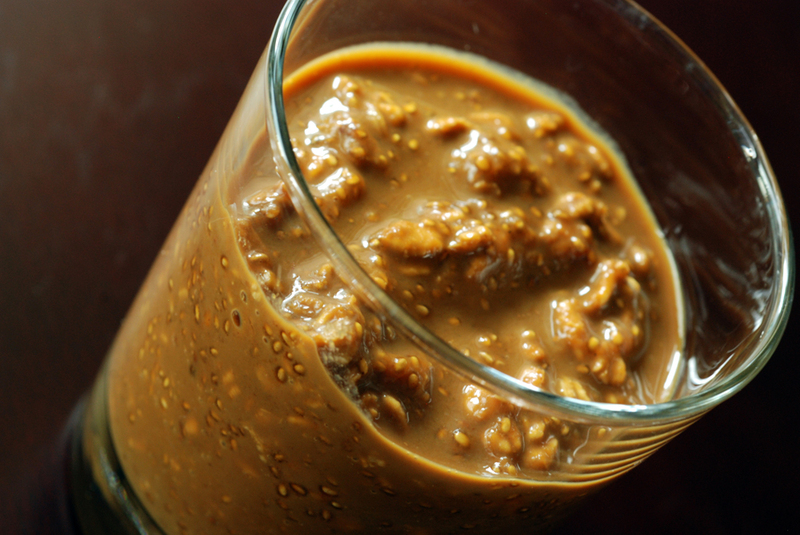 In fact, with only 2 tbsp for the entire dish, the peanut butter is not a dominant flavour. I felt like it was more to add creaminess but occasionally I would get a hit of the peanut butter. I don’t think it mixed in as well as I had thought. My advice is to add to taste, mix it well, but you don’t need much. Another nut butter could easily be substituted. This is my submission to this week’s Weekend Herb Blogging hosted by Huan from Eat.Read.Live. It is my pleasure to host Healing Foods this month. Siri started this event to highlight the health benefits from a variety of foods. There are so many healthy options when you eat vegetables, but I wanted to highlight one of my favourite winter vegetables: winter squash. Whether your preferred squash is butternut, acorn, kabocha, pumpkin or spaghetti, winter squash is filled with vitamins (great sources of A, B and C) and fibre, while being low in calories. Most importantly, they all taste great. Squash is versatile and can be used in soups, sides, main dishes and even desserts. It can be boiled, baked, or steamed. It can be sweet or savoury. And this is why it is so easy to fall for squash. Join me this month by sharing your winter squash and pumpkin recipes. To participate, please create and photograph a vegetarian dish with winter squash, linking to this announcement and Siri’s Healing Food event page by December 31, 2010. Email me at saveur11 AT yahoo DOT ca with your name, your entry’s name and url along with a photograph of your dish. The dishes must be new and posted between December 1 and 31. You may submit as many entries as you like. I look forward to seeing everyone’s creative dishes.